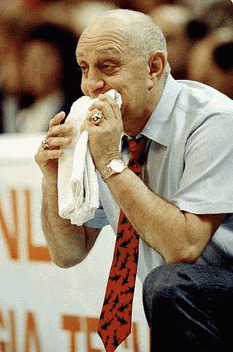 The Amoeba defense was developed and used by late coach Jerry Tarkanian (990-228 career coaching record) at UNLV some years ago. Duke coach Mike Krzyzewski once said of Tarkanian, "Jerry had consistent high levels of success because his teams played hard defensively. He's one of the truly remarkable defensive coaches." This is a gambling zone defense that, if run well, will help you get some steals and fast breaks. I had previously stated that, "It probably would not be wise to structure your team's entire half-court defense based on the Amoeba. Rather, use it as something disruptive, that you can throw in at various times in a game to confuse the opponent, and force some turnovers. In fact, I believe that Coach Tarkanian played man-to-man defense, and the Amoeba." But now coach Ryan McCarthy, University of Alaska-Anchorage Women's Head Coach, has expanded Tark's original Amoeba defense. He calls it the "Mayhem" Amoeba-Style Defense. Coach McCarthy has improved upon the blueprint created by Coach Tarkanian to create a version of the defense that can be sustained through an entire game. This defensive style will combine both pressure man-to-man and zone principles to be as disruptive as possible for your opponents.